IWS R-DWC submerges the roots in a highly oxygenated nutrient solution which encourages rapid growth but also allows the nutrient solution to be recycled into the feed tank, cooling and mixing the nutrient solution of each pot module. 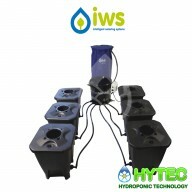 IWS R-DWC PRO 4 POT The IWS RDWC Pro systems represent the next generation of deep water cultivation. 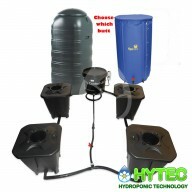 The big difference between RDWC and the previous DWC systems is that they recirculate the nutrient solution to keep the EC and PH more stable and balances whilst also helping to prevent pythium a..
IWS R-DWC STANDARD 8 POT The IWS RDWC Pro systems represent the next generation of deep water cultivation. The big difference between RDWC and the previous DWC systems is that they recirculate the nutrient solution to keep the EC and PH more stable and balances whilst also helping to p..
IWS R-DWC STANDARD 12 POT The IWS RDWC Pro systems represent the next generation of deep water cultivation. The big difference between RDWC and the previous DWC systems is that they recirculate the nutrient solution to keep the EC and PH more stable and balances whilst also helping to prevent pyt..